When Seema who blogs at Mildy Indian suggested the above theme, I didn’t even want to know what the other choices were. I like something that jolts me from my comfort zone and this was just the right theme. Basically for this theme we could prepare any dish and then work on the photography or presentation, pretending that its for a magazine cover. How exciting would that be in reality. In reality I would not be the one photographing the food or working on the presentation. I would have to just cook the recipe. Well, we all can wish for anything dear to our heart. Before I go into the recipe, I must mention that Seema has had the opportunity to stay in several countries and what I like about her blog is that she writes a bit about her stay in these places, her travels and also learns the cuisine and use local ingredients. Please check out her blog. Coming back to the recipe, I recently had to travel to Nairobi, the capital city of Kenya to get US and Thai visas. We stayed at hubby’s cousin’s home this time (usually stay with my kaki and kaka). I learnt an easier sourdough bread recipe from him and couldn’t wait to get back home to try out the recipe on my own. I decided to use the recipe for this theme. Photographing bread is not the easiest as besides antique knives, butter, good spreads what else can one use as a prop? The star has to be the bread. However, I gave it a shot. The easier thing would have been to make a dessert and make the photo all colorful. Anyway waiting for my main critic, my daughter to check out the post. Its at times like this I wish she was here. However, as she constantly reminds me that I have to learn. Remembering her tip on some food photos being minimal I really hope that to some degree it does meet the magazine cover criteria. A few years ago my hubby’s cousins had come down to Mombasa and stayed with us for a week. While hubby went to work, the younger cousin would be busy on his computer and the elder one would be in the kitchen, watching what I’m making and giving tips. We got talking about sourdough and we tried baking a sourdough bread. The starter was perfect but the bread dough was another story. As minutes turned into hours, the dough became so so soft that we just couldn’t handle it without it getting stuck everywhere on the counter. We didn’t even know the right technique to proof the final stage or didn’t have the right equipment. After adding copious amounts of flour, we finely managed a bake a shapeless bread that tasted sour but nothing like the authentic one. After that I tried once again and messed it up as I was not able to transfer the proved dough onto the baking tray. It fell flat! After that, though I always have a sourdough starter in my fridge, I usually make breads where a bit of the sourdough is used along with the yeast. In the meantime, cousin must have been through tonnes of flour and sourdough starters to perfect the technique that is workable without a banneton proofing basket, a dutch oven or an iron cast pan. When I was at his place, he made about 4 loaves of sourdough bread to show me his technique. Not much kneading was required and if the sourdough starter is perfectly hydrated then the bread turns out awesome. Before I forgot how to proof and bake it, I had to try it out. I really can’t thank hubby’s cousin enough, teaching me how to make a perfect loaf of sourdough bread. Now my brains are working overtime and want to bake some more with added ingredients but I really have to hold on as by Friday I need to shut down my kitchen. I’m traveling on Monday to Mumbai and from there to Bangalore. We’re actually away from home for a whole year, which means need to shut down the fridge and clear the pantry completely. Though my bread didn’t have the typical holes, the taste and crunchiness was perfect. With practice and trying to make the dough more suitable for my humid and hot climate, I’m sure I’ll be able to make the bread perfectly. Lets now get into the manageable technique of making a perfect sourdough bread. For perfect measurements of the ingredients for this bread, I had to use the weighing scales and not cup measurements.For the technique and various steps check out this video. Sift the flours, gluten, salt and sugar together in a bowl. Add water and knead it into a shaggy dough. Cover the dough with a lid or cling film and leave it in the fridge for 2-3 hours. Before going to bed, remove the dough and starter from the fridge. Let both reach room temperature overnight. Next day, flatten the dough using your fingers. Smear the starter all over it. Using your finger tips, work the starter into the dough by creating dimples or holes. Place the dough in a kneading machine and on minimum speed let it run for 5-10 minutes. The dough should become smooth and stretchy. Or you can fold and knead the dough by hand. Shape the dough into a ball and place it in a clean bowl. Cover it and place it in a warm place. After 1 hour, with wet hand, take a bit of the dough, pull and stretch it gently, and fold over. Repeat for 4-5 folds.Each fold will become tighter. Cover the dough and let it rest in a warm place. Repeat the folding like in step 10 after an hour. This step has to be done 6 times… after each hour fold. After the 6th time, let the dough rest for 10 -15 minutes, then take it out on a lightly dusted worktop and shape it into a ball. Be gently as by now air bubbles will have formed. Use a 7-8 inch wide bowl, cover it with a clean kitchen towel or thin cotton cloth. Dust the cloth generously with flour so that the dough comes out easily. Place the shaped dough in the cloth covered bowl. Cover the top and let it rise for 2 – 4 hours in a warm place. It is ready when the dough becomes double the size. Preheat the oven to 220ºC along with a baking tray and a big steel or heatproof bowl. Both should be really hot. Take the tray and bowl out of the oven. Place hot water in a heatproof container at the bottom shelf. Dust the tray lightly with some coarse maize meal flour or semolina. Gently turn the bowl with the dough in it, over completely onto the hot tray. Remove the bowl and gently peel off the cloth. Using a sharp knife or blade make 2-3 slashes on top of the dough. Cover the dough with the hot bowl. Bake the bread for 20-25 minutes. Remove the bowl and lower the temperature to 180ºC. Bake the bread for another 30-35 minutes or till the loaf is dark golden brown. If you knock the bottom of the bread it should sound hollow. Remove the bread from the oven and let it cool on a wire rack. Slice it when its cold and hear the musical crunch crunch. Serve it with your favorite soup, stew or enjoy it with some jam, make a sandwich or just toast it and enjoy it with some butter. Mix all the three very well till it becomes gluteny. Leave it outside at room temperature for 1-2 hours or till its double the size. Put it in the fridge till required. You will have some leftover after adding the required amount to the dough. Use that to make the next batch of starter. I followed the method of making sourdough starter here. Check it out.Its easy to follow and foolproof as long as you keep feeding it correctly and also keep it in a relatively warm place. I will probably have a post on how to make the sourdough starter, step by step with photos later on. When folding work on the dough gently. Sourdough starter should be bubbly, airy, frothy. If its not like that then its not active and needs to be activated. You will have some activated starter leftover, feed that with 30g water and 30g flour to make some for the next bake. Dust the cloth generously with flour otherwise the dough will get stuck to it. You can knead the dough by hand. Just check the video how to knead with your hands. Use a banneton for proofing and an iron cast pan for baking if you have them both. If you use bread flour then don’t add gluten. Oh, wow! The sourdough looks just perfect! ♥️ Great share! I love a good sourdough bread. It is a great skill to be able to make one. It is a skill to make sourdough bread Heidi, but I love it. Your bread look so delicious! Definitely worthy of any magazine cover – yum! Mayuri, firstly your daughter is going to be super happy with the images. Great light and sharp photos. Secondly, the sourdough looks great with very visible air pockets showing good hydration of the dough. I don’t prefer too many pockets as it doesn’t give a chance to smear something on it so this is my kinda slice. As an eternal bread lover, I am now super tempted to bake something over the weekend. Thank you Vidya for the kind words, still waiting the results from my daughter… its as though I sat for an exam. First to get my brother in law’s approval for the loaf and then my daughter for the clicks 🙂 Life definitely keeps me on my toes. I love baking my own bread but haven’t tried sourdough yet. It’s definitely on the list to make asap! Must try it as it brings great satisfaction and a sense of achievement. This looks amazing, sourdough is a real art and I couldn’t keep my starter alive! Well done. Thank you so much, I’ve taken care of my starter like a baby. I don’t know how you managed to take such good pictures of a sourdough bread. My bread images never do justice to the taste and flavour of the bread, whether I show them whole or sliced, or whatever! A perfect recipe and image for a magazine, and a perfect share for this theme! Thank you so much Sujata, breads are difficult to click and I still think it could have been better. The sourdough bread looks very inviting di ! Perfect share for the theme ! I adore sourdough bread but have never tried to make it, I definitely will now! Look at that beautiful crust and sort fluffy interior, just perfect! Gorgeous Cover Pic!!! Sourdough bread looks so gorgeous.Perfect crumb smeared with Jam..Aah…makes it so tempting.Fantastic Share.I am yet to try Sourdough bread.Bookmarking this recipe. Thank you so much Preethi, the bread tasted yummy with butter and jam. Mayuriji, you got a perfectly baked boule! !The bread looks so crusty, loved the texture too!! Very detailed recipe with nicely explained steps. Thank you so much Swaty, my teacher was really good. He too explained everything in detail. Bread looks so perfect Mayuri. Loved the tiny holes. And pictures are also beautiful and perfect for magazine cover. You know I also hesitate to share my pictures because of daughter. On every picture I sent her she said pictures are good but not like high resolution magazine cover pictures 😁. Its all of you who encouraged me to share. But your pictures are really too good. Loved it. Thank you so much Sujata. You may remember how my photos were when I joined the group, they were so bad. Have slowly learnt over the years and still learning. Thank you so much Freda. I am yet to try my hands on baking a sourdough from scratch at home. Long process but when you see a good results all the efforts are worth it. Bread looks delicious. Thanks Jagruti, after you’ve baked your first one then you’ll want to bake it again and again. The sourdough bread looks so awesome, wish I could grab it. Perfect for a mag cover. Sourdough is something I am nervous to work with. I know it needs time and patience, and I lack both, unfortunately. 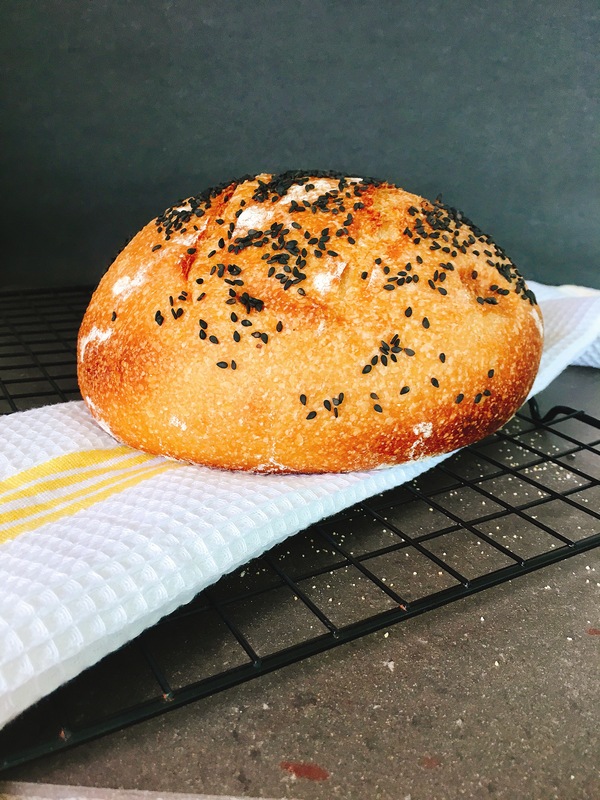 Your bread looks perfect, with those big holes and such a pretty shape… so well done! Thank you so much Rafeeda, I have all the patience in the world if I need to bake a good loaf. Sourdough is my favorite! This looks amazing! Thank you so much Sasmita. Once you master the technique its not too difficult. If that sourdough cannot bring a smile in the morning nothing can. I will love to see this as a magazine right next to my slice of toast. Perfect. Wow!!!! Mayuri I am floored. This is an amazing picture of an amazing bread! Sour dough at that! How I wish I can get my hands on the bread or better still on your starter. I have to try making this beautiful bread but now that the heat has started will wait till the next season to try my hand. Or on second thought say what the heck and waste another lot of dough 😀 ! I am sure your daughter had nothing to complain about with these pics. Absolutely beautifully clicked. Thank you so much Archana, the heat may help to get the sourdough starter ready sooner.